New Delhi: Cricketer and newly elected Rajya Sabha MP Sachin Tendulkar on Saturday said no to staying in the bungalow allotted to him saying he did not want to waste tax payers' money. Sachin refused to take possession of 5, Tughlaq lane allotted to him in the capacity of being a Rajya Sabha MP. Speaking to CNN-IBN, Sachin explained why he decided against taking the bungalow opposite AICC General Secretary Rahul Gandhi's house. "I am not keen on staying in any government bungalow when I will be in Delhi for only a few days. I feel this would be a waste of tax payers money and it would be better if the bungalow is allotted to someone else who needs the bungalow more than me." The cricketer said that he would prefer to stay in a hotel in Delhi every time he is here. "For me the honour of being nominated as a Rajya Sabha MP matters much more than the perks and privileges like being given a government bungalow," added Sachin. 5, Tughlaq Lane was previously occupied by former Delhi chief minister Sahib Singh Verma and former Haryana chief minister Bansi Lal's son Surender Singh. Sachin is the first active sportsperson and cricketer to have been nominated to the Rajya Sabha under the Prominent Citizens Quota. Sachin was nominated to the Upper House along with film actress Rekha and industrialist Anu Aga in April, but had to wait to take his oath until the end of IPL season 5. The nomination of Sachin had sparked a political slugfest with the opposition parties questioning the timing of the move by the government. The Bharatiya Janata Party (BJP) and the Shiv Sena had said that the timing of the nomination suggests that it is aimed at distracting attention from scams. A first time Member of Parliament is allotted a Type 5 or Type 6 accommodation. 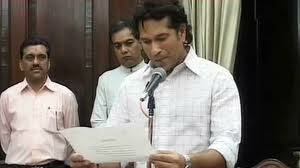 However, due to security reasons, special exception was made for Tendulkar. He has been allotted a Type 7 bungalow, which is spread over 7,000 square feet, has big lawns and five spacious bedrooms. The bungalow will be done up before the start of the Monsoon Session of Parliament, when Tendulkar is said to debut his political innings.